Satmetrix is a SaaS (software-as-a-service) based software solution that helps clients managing and improving overall customer experience, by collecting continuous and actionable customer insight. They are the co-creator of the Net Promoter ® methodology and, every year for the past nine years, they hold a dedicated conference in London. During the International Net Promoter Conference, Customer Experience executives and professionals gather to share best practices with leading experts and to network with peers to build and scale world-class Customer Experience programs. This year I was there too and below you find my highlights from the two days Conference and the NPS2 Upgrade Certification. The conference took place at Stamford Bridge, the basis, for football fanatics, of the CFC – Chelsea Football Club. Despite being Italian, I’m not quite a football fanatic and, in fact, I only seem to be going to the big stadia for business events. I enjoyed having the chance to be in beautiful London city, where I hadn’t been since my time at Forrester Research. The conference is preceded by few days of training for who is interested in taking the NPS certification. Being already a Net Promoter Certified Associate, I joined only the last day of training during which the new NPS2 methodology was introduced. While it’s always good and inspirational to get additional insights and methodologies, it was for me extra valuable to get validation of the fact that the “NPS Household & Journey methodology,” that I’m using with my clients, was already including the new findings & best practices. And it was valuable the extra peer to peer exchange that took place during the training, both a confirmation (and sort of reassurance) that most companies – especially big international ones – are having the same challenges and an opportunity to exchange ideas on what works best to address these challenges. The conference itself lasted two days. 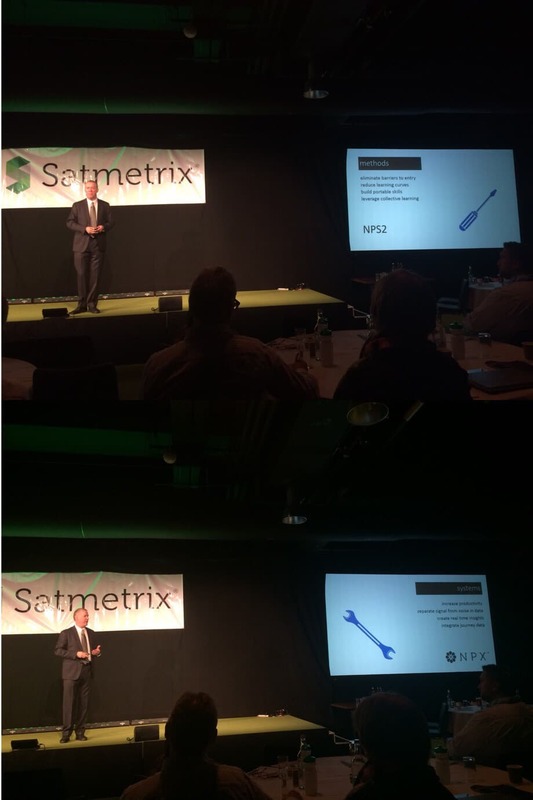 It was open by Satmetrix President and CEO Richard Owen, reinforcing why Net Promoter is so essentialin today economy and introducing why NPS2 as a new methodology. “90% of advertisement money just go lost without generating any value“: historically companies have spent much money on advertisement. When done right, ads may create awareness, in best cases they can even be highly entertaining and go viral, but ultimately they don’t create value for the end customer. Vice-versa, focusing that investment on customer experience, and even more so on overall lifetime opportunity rather than on a one-off transaction, will not only generate lasting value to customers and society, but it will generate word of mouth advertisement, which we know is the most effective and trusted one. The conference continued with eight keynote speakers – including thought leaders, like The Temkin Group’s Aimee Lucas, author Stephan Osthaus, Jill Dean of Brand Biology, Bob Thompson from Customer Think, and deep-dive case studies from CX leaders like Airbnb and Virgin Media. Also five different break-out sessions, each with a choice of three options, and plenty of break-time to network with peers and exchange insights. All in all plenty of valuable content and sharing. Across all sessions and peers exchange I had, the following eight recurring themes kept coming up and seemed to be valid for most of speakers and attendees. Focus has shifted from data (and score) to continuous insight and action. It’s not one metric or the other to drive the real differences between leaders and laggards companies, but their capability to gain insight from unstructured feedback and drive meaningful & innovative action! We need continuous insight to address the increasingly faster pace of transactions. Culture is a key element to customer engagement: successful companies have embraced service as a mindset. They aren’t driven by profit. Profit follows because they are customer-driven. These companies also “drink their own champagne“: they empower their employees to use the company products actively and repetitively. Emotions are finally getting the attention they deserve. They need to be the new focus as they have the strongest impact on customers perception and NPS. Emotional engagement and human-to-human touch are essential not only for customer happiness but also for employees happiness. Customers are not alike! Defining your target segment and their persona is a fundamental first step. Mapping these customers journey is the next step. Adding a “customer room” (cit. Jeanne Bliss) in your office, or physically show the journey in your office corridor (let’s call this the “customer journey hall“), is the next step to make sure every decision in your company is taken thinking of the end consequences of the experience. Execution is the real challenge: at the end, great customer experience is about execution. This was for me the “revelation” of this conference. I almost cannot believe that I had missed on such a great best practice example. The new Zappos case study. Literally. Starting from how they define themselves: “in the business of service, which happens to be a waste.” Their foundation and purpose are to deliver customer excellence. I confess I had a moment of “first sight company love“. As Louise was talking, I could only think “When are you expanding to NL? I want to be your customer!“ I became a real example of “customer advocacy.” Mission accomplished The City Bin. And not just with me! With an astonishing fluctuation between 64% & 78%, apparently due to price sensibility and their churn rate below 4% (versus an industry average of 10% ) their NPS proves, they are one of the most trusted and promoted customer brands and, what I define “a happy business with healthy growth ahead”. Having spent myself years in customer centers and still starting most of my projects by visiting one to listen in and observe some sample contacts, I loved that this speech started very pragmatically showing us a “real-life” scene. Joe, a student who recently received a car from his parents under the promise he would take care of arranging and paying the insurance, is first having a phone call with his mother while in pub, then later talking on the phone to Sarah, the car insurer agent, while the screens were showing us what each of the actors (Joe is the prospect customer and Sarah, the agent) were thinking as they spoke. We observed first what is, unfortunately too often, the “standard call” (where they just couldn’t quite connect to one another). At the end of the speech we saw how differently that call could go if the agent were able (because trained and empowered!) to recognise the type of character she had on the phone and to react accordingly, while still staying true to herself. True reciprocal empathy! Loved it! “There is a myth to debunk: treat others like YOU would like to be treated.” According to CEO Jill Dean this is nonsense! And I agree. That principle only works if you are dealing with someone like you, and, when generalising in scripts and rules, only if every customer would be the same. But they are not. We are not the same. We are human. And we are all the different. Hence a better approach is “Treat others like THEY want to be treated“. But how can you know how they want to be treated? Trouble couples like trouble customers (Detractors) tend to argue a lot, be very vocal have even strong arguments. However, they often stay together forever (or at least as long as happy couples). There are two types of Detractors: 1) the ones who hate you and will leave you, 2) the ones that expect much from you and are simply disappointed in you right now, but want you to improve and tell you how. The real trouble is the Passive couples, the one who have entered the “deadly zone of mutual indifference“, they are silent, they don’t complaint because they don’t even care about you anymore, and they will leave very quickly. Especially with software, customers often don’t complain because they think is their fault (or lack of knowledge) that things are not working. But it doesn’t matter whose fault it is, you need to collaborate to make it work. Customer Success Manager is the software industry answer to this problem. Not s sure why I still feel surprised every time I hear an executive say that “they were in customer feedback denials.” I’m so much of a Customer Experience believer that sometimes I forget others need to be convinced or proved of that. Even more, it was very inspirational for me to hear Travelodge’s acknowledgment: “Travelodge was crashing not because of the financial crisis, but because customers were telling us <<we don’t like u>> & we were not listening.” They completely changed their strategy as of 2012, which included an unyielding focus on employee engagement and daily peer-to-peer training and shadowing. Or you can see the full event summary in Tweets on the dedicated Eventifier page (which btw is another great discovery made during this event). Did you attend any other session that was especially interesting? Do you have anything to add? Let us know in the comments below.